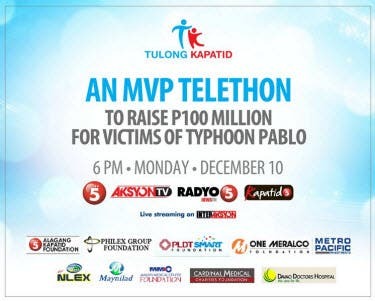 Tulong Kapatid, represented by the officials of the MVP Group of Companies, is pledging support for communities displaced by Typhoon Pablo by holding a four-hour telethon today, December 10, from 6:00 to 10:00 PM on TV5, Aksyon TV and Radyo Singko. This is in response to reports from the National Disaster Risk Reduction and Management Council (NDRRMC) that the strongest storm to hit Mindanao in two decades took almost 600 lives, with another 827 missing and affecting over a million families. Tulong Kapatid, the joint corporate social responsibility and disaster response initiative of the MVP Group chaired by businessman and philanthropist Manuel V. Pangilinan, will collaborate with Kapatid personalities from news and entertainment, as well as celebrity endorsers of various companies under the MVP Group, to man its phone lines and accept pledges from the public. “We at Tulong Kapatid are coming together to raise awareness and financial support forKapatids severely hit by Typhoon Pablo. During this time when our fellowmen are in need, we are called upon to initiate efforts so that communities affected by Pablo can rise again,” said NEWS5 Chief Luchi Cruz-Valdes who also heads TV5’s charity arm Alagang Kapatid Foundation. Tulong Kapatid will accept and course contributions via Alagang Kapatid Foundation. For cash donations, interested parties may deposit through the Foundation’s peso account at BDO (savings account number 00-5310-410164 with swift code BNORPHMM), CITI Bank (savings account number 0757138018 with swift code CITIPHMX) and BPI (savings account number 1443-05333-2 with swift code BOPIPHMM) under the name of Alagang Kapatid Foundation, Inc.
For Kapatids overseas who want to donate to the cause, they may do so via the following US dollar accounts: BDO account number 10-5310-46264-4 with swift code BNORPHMM; CITI Bank account number 0757138026 with swift code CITIPHMX; and BPI account number 1444-0214-85 with swift code BOPIPHMM. Cash donations may also be coursed through Cebuana Lhullier outlets nationwide. Aside from TV5, other members of the MVP Group of Companies are: PLDT, Smart, Sun Cellular, Maynilad, Meralco, Metro Pacific Investments Corp., SPi Global, Asian Hospital and Medical Center, Cardinal Santos Medical Center, Makati Medical Center, Metro Pacific Tollways, ePLDT, iPlus, Our Lady of Lourdes Hospital, Cignal, Philex Mining Corp., PLDT Global, Davao Doctors Hospital and Dr. Pablo O. Torre Memorial Hospital. Comedy King Dolphy to Transfer to TV5?